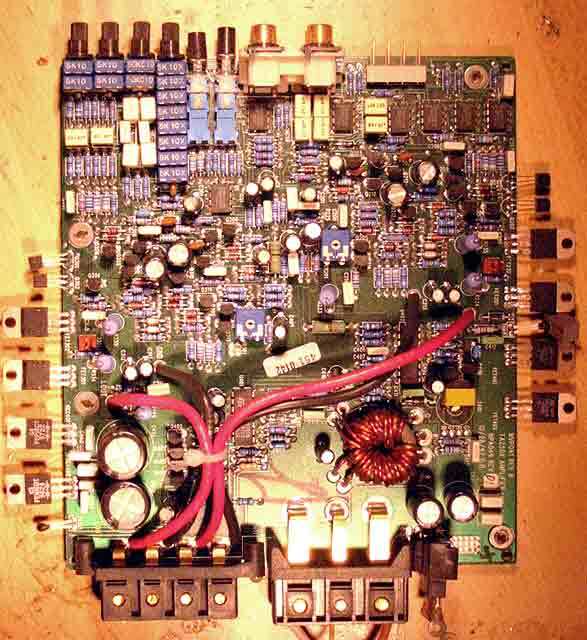 This is a small 2*25 (actually, 2*50) WPC amplifier with 3-order crossover stage (configurable as LP or HP). Of particular interest is the unconventional autoformer PS arrangement. Since the power FET's drains are not tied to ground anymore, it needs another transformer to drive gates. Gate driver is TL494 + MPSW56 followers, powered by REMOTE line. The autoformer is small (25mm), windings are bifillar, single-strand 1.2mm wires. Both idle and full-load signal at secondaries is perfectly rectangular. 1:2 stepup results in 24V DC output (idle, unregulated). Idle draw is 1A @12V DC. PCB is not too good by audio standards. Too many vias, parallel tracks, etc. Mechanically, the amp is solidly built, has a good thermal balance despite smooth powder-coated exterior. Amplifier uses N-FETs (2 devices per channel).